King of the Lonely Mountain and of Durin's Folk. Dain II Ironfoot was born in 2767 of the Third Age. He was the son of King Nain of Durin's Folk. Dain was descended from Durin I. Dain II Ironfoot came from the Iron Hills, but when the quest of Erebor reclaimed the Lonely Mountain in 2941, Dain's people moved there. Dain had a son named Thorin III Stonehelm. In 2799, Nain and Dain II Ironfoot fought in the Battle of Azanulbizar. Nain was killed by the Orc-commander Azog, but in a fit of rage Dain avenged his father's death and killed Azog, beheading him with a red axe. The Dwarves won the Battle of Azanulbizar by a small margin, but were ultimately the victors of the War of the Dwarves and the Orcs. 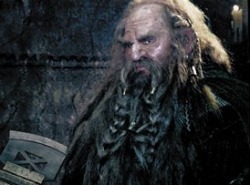 However, Dain knew that Dwarves should not resettle Moria because the Balrog still dwelt there. Dain II Ironfoot was crowned King of Durin's Folk in 2799 after his father's death. Dain's Dwarves began to prosper as they mined for riches and produced valuable items such as extra flexible mesh used in battle as mail. In 2941, Dain learned from a raven that Thorin Oakenshield had been successful in the quest of Erebor and Smaug, who had overtaken the Lonely Mountain many years before, was now dead. However, Dain also learned that Elves and men were trying to claim their own share of Smaug's treasure, while Thorin firmly believed that the Dwarves should earn the entire hoard. Dain raised and army to help Thorin and his army marched to the Lonely Mountain. However, when they arrived they found that Goblins and Wargs had also come to make war with the Elves and men, as well as Thorin and Company. Tensions broke out into the Battle of Five Armies. Dwarves, Elves, and men fought together against Goblins and Wargs. Though it cost them many lives, the allied forces of the Dwarves, Elves, and men were victorious. Thorin was killed and Dain became King under the Mountain while also ruling Durin's Folk. Many Dwarves of Durin's Folk came to live in the Lonely Mountain. Dain made many important allies including a strong alliance with the men of Dale as well as an alliance with Eagles. In 3017, a messenger of Mordor arrived at the Lonely Mountain seeking information concerning Bilbo Baggins and the One Ring. The Dwarves refused to tell the messenger anything and sent him away. The messenger returned many times and claimed he would require the Dwarves to answer. He promised to return three of the Seven Rings to the Dwarves if they told all that they knew of the One Ring. Dain resisted pressure from the messenger and kept sending him away. In 3018, Dain sent Gloin and Gimli to attend Elrond's council in Rivendell. Dain told Gloin and Gimli to warn Bilbo Baggins of Mordor's pestering messenger. In 3019, Easterlings from Rhun under the service of Sauron attacked Dale and the Lonely Mountain. Dale's King, Brand, and Dain II Ironfoot gathered their forces and met the Easterlings in battle. The Battle of Dale broke out, and on March 17 Brand was killed. Dain II Ironfoot stood over Brand's body until he himself was killed. Easterlings could only be driven out of Dale after the War of the Ring. Dáin was the name of a Dwarf in the Old Norse poem Voluspa. Dain was called Dain II because there was an earlier King of Durin's Folk named Dain I. He was possibly called Ironfoot because he came from the Iron Hills and Dwarves there wore Iron shoes.